The following article is part of our cross-posting series with Information Dissemination‘s Jon Solomon. It is republished here with the author’s permission. It can be read in its original form here. 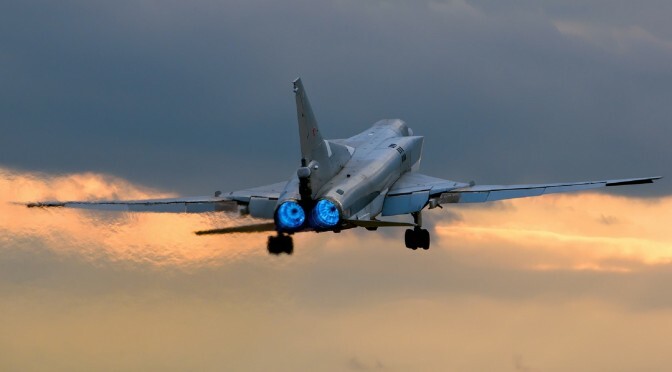 Last winter’s Naval War College Review contained a must-read article on the Soviet Navy’s doctrine from the 1980s for employing its TU-22M Backfire series of bombers against U.S. Navy carrier groups. In “Kamikazes: the Soviet Legacy,” former Soviet Navy officer Maksim Y. Tokarev reveals many details regarding Backfire capabilities and tactics that, to my knowledge at least, have not been previously disclosed within English-language open sources. As part of my 2011 master’s thesis, I conducted a case study examination of how the U.S. Navy used Electronic Warfare (EW) and tactical deception to counter Soviet long-range maritime strike capabilities such as Backfire during the Cold War. I found that while a considerable amount of information is now publicly (though not necessarily widely) known about the two sides’ tactics, technologies, and real-world operational experiences from the late 1950s through mid-1970s, relatively few details regarding the competition’s late-1970s through early-1990s peak have been declassified by the U.S. or Russian governments. Tokarev’s article sheds a remarkable amount of light on the latter period from the Russian perspective. In doing so, he also underlines timeless maritime targeting challenges that technology can partially ameliorate but never fully eliminate. He additionally paints an intriguing picture of how an advanced attacker might use tactical deception in an attempt to score a lopsided win in a battle at sea. In my posts this week, I will point out the most fascinating of the new details provided by Tokarev and then examine their historical significance as well as contemporary implications. What Kind of Reconnaissance Support did Backfire Need? One of the key historical questions regarding Backfire involves the reconnaissance support the bombers’ crews needed to effectively employ their missiles. The earlier TU-16 Badger series of Soviet maritime bombers depended upon targeting cues provided by scout aircraft. These so-called ‘pathfinders’ penetrated an enemy’s battleforce ahead of a raid in order to locate and positively identify aircraft carriers or other high-priority target ships. This was necessary because a standoff bomber like Badger simply could not tell whether a large contact held by its onboard radar was an aircraft carrier, a surface combatant or other ship configured to simulate a carrier, an artificial decoy, or a large and perhaps neutral-flagged merchant vessel. Even if a surface contact of interest made ‘telltale’ radio frequency emissions, the vessel’s type could not be determined with high confidence because of the possibility that the emissions were deceptive. Visual-range verification of contacts’ types (if not identities) was consequently a prerequisite for the Badgers to be able to aim their missiles with confidence. Yet, because the Soviet pathfinder aircraft necessarily had to expose themselves to the entirety of a battle force’s layered defenses in order to do their jobs, they represented single-points-of-failure that could easily doom a raid if neutralized before they located, classified, and identified desired targets. In the mid-1970s, the Soviets began launching Radar Ocean Reconnaissance and Electronic intelligence Ocean Reconnaissance Satellites (RORSAT and EORSAT) into low earth orbit. RORSAT and EORSAT were primarily intended to expand the maritime areas covered by the Soviet Ocean Surveillance System (SOSS), a networked ‘system of systems’ that fused data from a wide variety of remote sensors to locate, identify, track, and target U.S. Navy forces at sea. In theory, Soviet standoff bombers might not have needed the support of pathfinder scouts if SOSS operators were able to provide a raid with high confidence, targeting-quality tactical pictures derived from RORSAT, EORSAT, and perhaps other remote sensor sources. Backfire made its Soviet Naval Air Force (SNAF) debut in 1976. Unlike the subsonic Badger, Backfire could make its final approach to its firing position—and then its subsequent escape attempt—at supersonic speed. The SNAF’s Backfire-C variant, which reached Initial Operational Capability in 1981, carried enough fuel to make an indirect approach against a targeted naval force operating well beyond 2000 nautical miles from the Soviet coast. Defending against a Backfire raid was therefore an order of magnitude more complicated than defending against a Badger raid. The tactical dilemma facing a U.S. Navy battleforce would have been further exacerbated—potentially decisively—if a Backfire raid received its targeting data directly from SOSS instead of from pathfinders. Some later Backfire-Cs were even equipped with a communication system that allowed them to download RORSATs’ and EORSATs’ tactical pictures as those satellites passed overhead. From a purely technical perspective, though, it seemed quite unlikely Backfire could completely do away with reliance upon pathfinders or other visual-range scouts. As I detailed in my thesis, RORSAT suffered from the same contact classification challenges that inherently plague any radar. In fact, RORSAT’s shortcomings were even worse: its sensitivity was apparently so poor that it could only detect large ships, and even then not reliably when the area it was searching contained inclement weather. EORSAT was completely dependent upon ships complacently radiating telltale radiofrequency emissions, and as a result could not compensate for RORSAT. Lastly, as neither RORSAT nor EORSAT could report their data in ‘real time,’ their contact pictures generally suffered from tactically-significant lateness. Nevertheless, other than anecdotes from U.S. Navy veterans of the 1980s who directly observed SNAF operations when their carrier groups steamed into the “Bear’s Den,” and beyond some open source scholarly interpretations of Soviet doctrine dating to the early 1990s, until Tokarev there has been virtually no authoritatively-sourced evidence available to the public confirming or refuting Backfire’s dependence upon pathfinders. These statements tell us two things. First, while Backfires could use direct satellite-based cueing, they relied heavily upon—and in fact placed greater trust in—targeting provided by scout aircraft. Second, a Backfire (or any Soviet maritime bomber) sortie depended upon raid planners being told approximately where a U.S. or NATO naval group was operating. If SOSS or any other surveillance or reconnaissance capabilities supporting this general cueing was disrupted or deceived, a raid might be dispatched to the wrong location, might be wasted against a decoy group, might be exposed to an ambush, might be held back until too late, or might never be launched at all. We must keep in mind that launching a SNAF raid was no small undertaking. Per Tokarev, an entire air division—up to a hundred bombers—might be hurled against a single carrier’s battle group. Furthermore, doctrine called for the Soviet Northern and Pacific Fleets to be equipped with three air divisions each in order to counter multi-carrier battle groups. Tokarev also mentions that the bomber attrition rate for a single raid was expected to be as high as 50% regardless of whether or not the objective U.S. or NATO warships were successfully struck (Tokarev, Pg. 73, 78). With a finite number of bombers, missiles, and trained crews, it is reasonable to think Soviet commanders would have been somewhat hesitant to dispatch such irreplaceable forces into battle unless they had some degree of confidence in their situational picture’s accuracy; the operational-strategic penalties that would be incurred if they ‘got it wrong’ simply seem too high for this not to have been the case. Accordingly, it will be extremely interesting to someday learn the criteria that had to be satisfied for SNAF commanders to order a raid. In part two of the series, just how effective was U.S. Navy counter-targeting? This makes for great study material regarding modern CBG EMCON deception lessons to counter the DF-21 Anti-Ship Ballistic Missile from China.